Zengchong village in Guizhou province, nestling in the bend of a river, is one of Carter's favorite photos. There is no single image that can adequately represent the diversity that is China. This is partly why Tom Carter's 638-page tome of photographs taken during his tour of the country between 2006 and 2008 works so well. 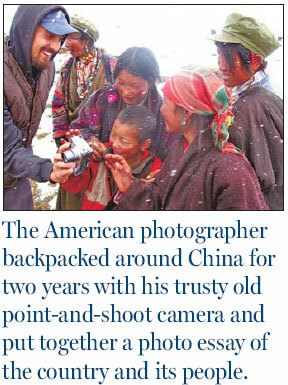 China: Portrait of a People is a snapshot in time of the country's diverse people, provinces and regions. Carter graphically documents the old China (some of which has already disappeared) as well as the work in progress that is New China. He shows us the grand vistas and peeks behind the curtains, too. There is little text, just introductions to the various provinces and regions with a personal note or a Chinese poem. The pictures speak for themselves. "The goal was to portray China as it portrayed itself to me," Carter says of his travels with his trusty Olympus Camedia C4000, a no-frills four-megapixel camera. And while the quality of the pictures is not coffee table standard, the lack of gloss emphasizes the absence of Photoshopped trickery that characterizes other photo books. This is an honest work. The 36-year-old from San Francisco is a political science graduate who worked on several state and national campaigns, but became so disillusioned with the "finance and marketing that comes with politics" that he gave it up to indulge his wanderlust. He now claims to be apolitical, though his black T-shirt with a communist red star would appear to suggest something else. A San Francisco baseball cap, and tattoos of the Virgin Mary and Sacred Heart on either arm indicates the Catholic wears his heart on his sleeve, literally. After tracing his Cuban-Panamanian roots and exploring Central America, Carter came across an advertisement to teach in China and touched down in 2004. The job was a "scam" but he "pounded the pavement", found a teaching position and saved enough money to embark on what would eventually become a 33-province odyssey. The 20-year-old city of Dongying in Shandong province was his home for a year and the birthplace of his photographic career, which began with pictures of the children he taught clambering over desks, flashing toothy smiles and peace signs for their newly arrived teacher. As he discovered more about the city built upon the riches of China's second-largest oil field, Carter's lens peered into its streets, hospitals and entertainment districts, where he captured on film two girls kissing in a KTV (karaoke bar), an example of the type of entertainment provided for the oil industry businessmen who frequent these places. Part of the strength of this book is its independent spirit. It's not a travel guide showing China dressed in its Sunday best, or a photojournalistic approach documenting the underbelly of the country, but rather a peek at the sights Carter has seen and a corrective to both the glowing promotional images and negative Western media shots that we are all familiar with. For instance, if you were to make a pilgrimage to Mount Tai for the sunrise you would likely be one of many thousands doing the same and this is the image Carter presents - hordes of people dressed in green army overcoats - not the typical picture postcard view. His snaps of sleeping construction workers, the "pink light districts" of barbershops and dirty washing being aired in Shanghai put off the State-owned publishing house he first approached. So, he sought out a Hong Kong publisher instead. Young girls from Xiamen push the boundaries in body art. There are, of course, beautiful pictures, such as a white horse grazing under the watchful eyes of a near-naked man with long hair. It's like an image from a fantasy novel, all the more powerful because it is an unchoreographed scene from real life, of a tea caravan in the wilds of Tibet. 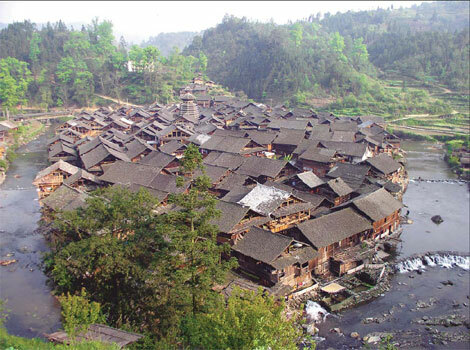 One of Carter's favorite photos is of Zengchong village, Guizhou province. It nestles between two streams and the aerial view shows tiled roofs, evergreen trees and a drum tower. It is an Arcadian scene and clearly Carter is in love with what he calls the "real China", unspoiled by progress. He decries the tearing down of hutong in Beijing, even if he knows that it is more convenient to live in a new apartment. "By definition that is the real China - because it's untouched by progress," he says. While defining China in this way seems consigning it to the past, this has not prevented Carter from capturing its breakneck development with the more interesting pictures in the book. Whether it is portrait shots of young Chinese, their piercings and tattoos, the neon sheen of Hong Kong or the juxtaposition of skyscrapers and cave dwellings in Yan'an, Shaanxi province, the photos are testament to the flux of change. Carter insists he's not a photojournalist, but he does have a knack for reporting. For instance, in Yueyang, Hunan province, he came across a crowd that was picking on a solitary policeman. Eventually, backup officers dispersed the angry mob. Though officials later tracked him down and requested his film, Carter insisted he was within his rights and the photos are now published for posterity. The book is also a document to the opening up of China. Carter went everywhere, including supposedly off-limit areas in Tibet. He says there's no way he could have done this 10 years ago and as such, the book provides a first look at the whole country by a visitor. Carter calls his photographic diary a "flattering portrait" but it is also a revealing journey of discovery that will interest not only tourists, but anyone curious about an unvarnished China. As his Chinese girlfriend, Hannah Hong, who accompanied him for a year on his wanderings says: "It took an American to show me the real China." A bare-chested coal miner catches some time-off in-between shifts. 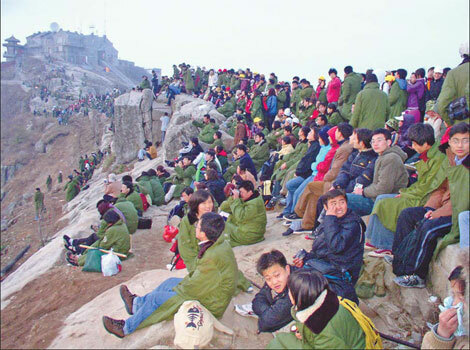 Eager pilgrims wrapped up in army-green duffle coats wait for sunrise on the peaks of Mount Tai. A dressed-up couple shares a passionate embrace.